Be it as the Head of Asia’s multilateral institutions such as SAARC and BIMSTEC, as a key game-player in global UN peacekeeping operations, as a new UNHRC member, as the first country to present a concrete action plan to endangered snow leopards protection and as a participant at global climate change conferences, Nepal has always been in the forefront in raising its voice for global-level causes. 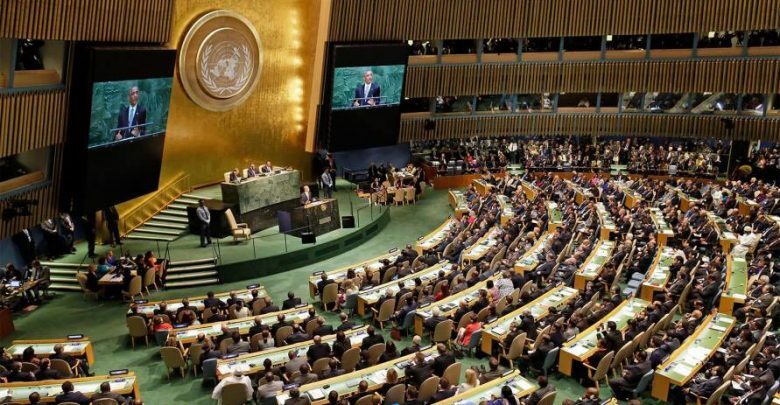 In the similar lines, Nepal has recently participated in another annual global-level conference, the 73rd edition of the United Nations General Assembly (UNGA) held in New York. 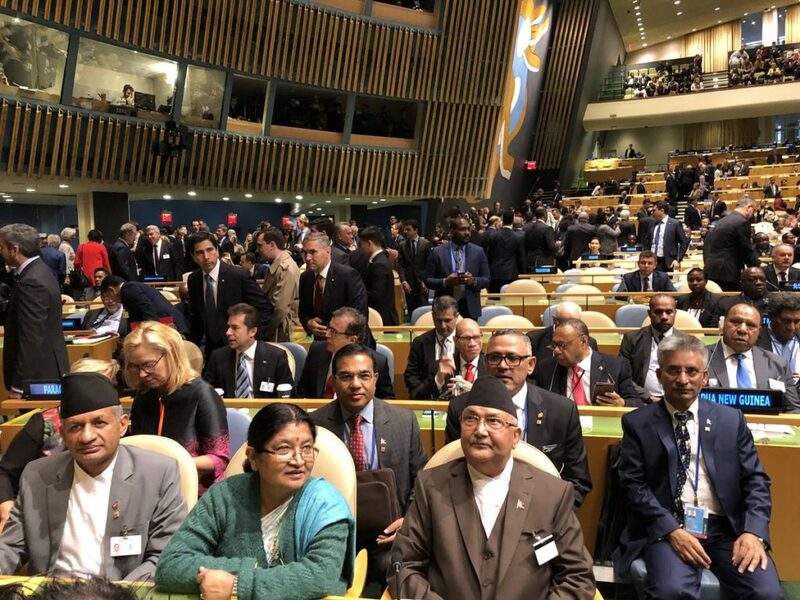 Nepali delegation, including Foreign Affairs Minister Pradeep Kumar Gyawali and others led by the country’s Prime Minister KP Sharma Oli actively participated various meetings and sessions as part of the #UNGA session. On the side-lines of the session, PM Oli and Foreign Minister Gyawali held separate and joint meetings with heads of various states present at the session and discussed on ways to enhance Nepal’s bilateral ties with world nations. 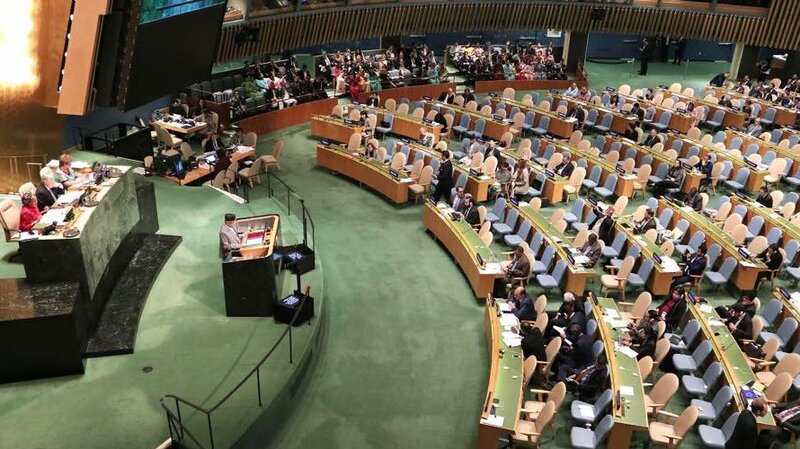 Finally, the Prime Minister has addressed the 73rd UNGA Session on September 27, 2018. I extend warm felicitations to you on your election to the presidency of this Assembly. The outgoing President deserves our appreciation for successfully steering the Assembly’s work. We commend the Secretary General, Mr. Antonio Guterres, for the dedication, commitment and leadership with which he has been serving the Organization. As we commemorate the 100th birth anniversary of Nelson Mandela, I would like to pay my profound respect to him and for the cause he fought for. An iconic figure, he was a great human soul and remains a source of inspiration for peace, justice, harmony, forgiveness and reconciliation. This year, we have lost an outstanding diplomat and visionary Secretary General Kofi Annan. I also pay sincere tributes for the tremendous contributions he made to promote peace, development and human rights in the world. 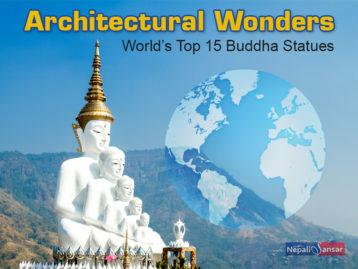 I bring greetings and best wishes from the Land of Buddha and Sagarmatha also known as Mount Everest for the success of this session. Since I addressed from this podium in 2006, Nepal has undergone historic political transformation. Through dialogue and deliberations, through mutual respect and accommodation, we steered a uniquely successful home-grown, nationally led and owned peace process. It was about institutionalizing and consolidating all those achievements in a democratic constitution through a popularly elected Constituent Assembly. 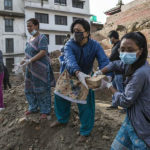 Despite the difficulties in the wake of devastating earthquakes, the political leaders rose to the occasion with a common resolve to promulgate the constitution in September 2015, thereby fulfilling the seven-decade long people’s aspiration to write their own constitution. The Constitution of Nepal not only consolidates democratic polity under a federal republican order, but also embodies extensive rights and freedoms of the people. Separation of power, checks and balances, the rule of law, independence of judiciary, periodic elections, inclusive and proportional representation are the defining features of the Constitution. Our vision is of a comprehensive democracy that empowers individuals not only politically, but also socially, economically and culturally. Implementing the Constitution was another paramount task before us. We accomplished this historic task last year through free, fair and impartial elections of federal, provincial and local levels with record turnout and the participation of the people from all sections of our society. Most importantly, the elections brought 41 percent of women into elected bodies. We remain committed to bridging the gap of the remaining 9 percent. The elections not only ensured democratic rights of Nepali people in the widest possible manner, it has also produced a strong government in many years. The Government that I head has over three-fourth support of the parliament. Governments in the provinces also enjoy strong majority support. We have achieved much needed political stability through these landmark elections. With these historic achievements, we have laid the foundation towards creating an egalitarian and just society where all citizens are treated equally and receive equal protection and opportunities. Social justice remains at the center of our polity. The United Nations and the international community supported our peace process for which we are grateful. Nepal’s case is a unique example of peaceful and democratic transformation. It is a telling testimony that dialogue triumphs the differences; and ballot triumphs the bullets. We believe that what Nepal has achieved in conflict transformation can be an inspiring success story for many people longing for peace in different parts of the world. We are willing to share our experiences and provide our insights. With hard lessons learned in the arduous journey of democratic transition, we have now emerged as a confident nation, capable of sustaining political gains and undertaking a course for economic transformation. Cognizant of the need for accelerating the process of development, my Government has set a vision for ‘Prosperous Nepal and Happy Nepali’. We will realize this vision with the right mix of prudent utilization of natural resources and the optimal mobilization and management of human resources that we are endowed with. We count on continued goodwill, support and cooperation from the international community in our development endeavors. Our foreign policy guides us to maintain amity with all and enmity with none. It has shaped our independent outlook on global issues which we consider on merit basis. We believe that regional and global efforts complement our national development efforts. In line with our foreign policy priority to regional cooperation, we have recently hosted the 4th Summit meeting of BIMSTEC. We would like to see a revitalized SAARC as an important regional organization. The world today is at an important juncture; with a unique juxtaposition of perils and promises. Challenges ranging from poverty, terrorism, climate change, food insecurity, forced displacement and natural disasters to arms race continue to confront the global community. Intra-state conflicts have taken heavy toll on millions of lives. For the first time in decades, world hunger is rising after a prolonged decline. In many regions, peace remains obscure. Inequality within nations, as well as among them, is increasing. Countries have failed to adopt sustainable production and consumption patterns. In this context, the theme of the general debate “Making the United Nations relevant to all people: Global leadership and shared responsibilities for peaceful, equitable and sustainable societies” resonates well the need of our time. 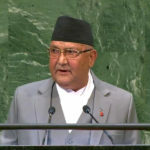 Madam President, Nepal supports the seven priority areas that you eloquently outlined in your inaugural address to this Assembly earlier this week. I hope the current session will seriously deliberate on these priority areas with seriousness and urgency they deserve. Here lies our political will and determination. With this commitment we must ensure that the voice of the people struggling for their rights, liberty, freedom and justice in various parts of the world, including Syria, Yemen, Palestine and many other places must be heard and addressed. The pursuit of making the UN relevant to all people is well captured in the philosophy of ‘leaving no one behind’. In its third year, global efforts in the implementation of the 2030 Agenda appear too few and far insufficient. Needless to say, the least developed countries are the battleground on which the 2030 Agenda will be won or lost. Development in LDCs appears dismal despite a record performance of global economy. International support measures are failing to make a dent. Implementation of the internationally agreed commitments made in their favor is far below our expectation. Reaching furthest behind first is not a luxury. It is not a charity either. It is an international obligation, a duty and social responsibility. The impact will be fully realized only when external support measures respect national ownership and leadership, are aligned with national priorities, come through national system, while they help build productive capacity, job creation and develop human resources. Only through smooth access to market, removal of trade barriers, injecting finance and investment, building capacity and transfer of technology and overcoming the infrastructural bottlenecks can enable LDCs and LLDCs take path to sustainable development and integrate themselves in the global value chains. When it comes to climate change; the clock of caution is ticking loud. The impact of climate change burdens the poorest and the most vulnerable countries, like my own country Nepal, despite their negligible emission. We cannot remain a bystander when snow-clad mountains, known as water towers of the world, are receding and glaciers are retreating, erratic weather patterns causing floods and inundation in the plains. It is an unpleasant irony that we have been victim of the catastrophes that we did not contribute for its causality. The impacts of climate change on mountain and small island countries have been felt as existential threat. The loss of lives, properties and bio-diversity, and increasing phenomenon of calamities are becoming untenable. A matching and robust response is required. We cannot evade from the responsibility nor will there be any excuse for inaction. We must act decisively in ensuring climate justice that respects the principle of common but differentiated responsibilities and respective capabilities. To make this happen, international cooperation and collaboration for adaption and mitigation is sine qua non. The Paris Agreement must be implemented in its entirety and good faith. The health and well being of our children and youths is an investment for future. Delivering quality education, imparting skills, and spurring innovation can make a virtuous composite to enable youths to be relevant and be able to contribute to society and nation building. We must support for the full development of their potentials, their creativity and energy to flourish. Inculcating entrepreneurial spirit and creating decent job opportunities for the youths can fuel economic development and help positively transform our societies. At the same time, we must also inculcate them with the civil and moral values so that they become a force for harmony and tolerance in society. The frontiers of technologies are ever expanding, and they have been major driving force for societal transformation. But the digital dividend is unevenly distributed, while the digital divide is widening. Technology has been a powerful agent of change and transformation. At the same time, technological revolution is disruptive. The developing countries, especially LDCs, are struggling to cope with the new modes of production and consumption. We must create an environment to ensure easy access to affordable technology and free the barriers for their transfer. This will provide a level playing field to all countries to benefit and propel economic growth through new technologies. This year, the UN has taken boldest of the reform initiatives in decades. The cross-pillar restructuring of the organization gives us an important opportunity to strengthen its development pillar and prove its efficiency in delivery. We believe that the re-positioned UN development system will better deliver on 2030 Agenda. To ensure a sound system, learning the new methods by a new generation of Country Teams is important. But more than that, unlearning the old habits – that implored us to undertake this reform – is equally important. What matters also in the reform is the transformation of the culture. The new culture must have accountability, transparency and national ownership at its core. Nepal welcomes the reforms undertaken in peace and security architecture as well as management of the organization. UN should reflect the mosaic of its membership, and achieve greater efficiency and effectiveness. The Security Council reform is long overdue. Any reform must reflect the current realities and ensure justice to historically under-represented and developing countries. 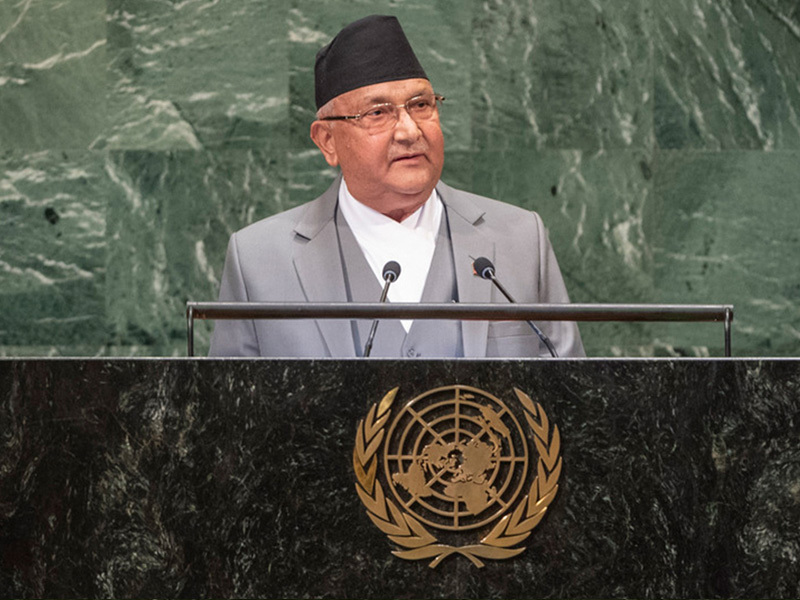 Nepal reaffirms its principled stand for a general and complete disarmament of all weapons of mass destruction. In this context, we welcome the recent efforts made by the United States and two Koreas towards denuclearization and peace and stability of the Korean peninsula. Nepal welcomes the Secretary General’s Agenda for Disarmament with a hope of renewed impetus to disarmament. Nepal commends the beginning of deliberations under the ‘Kathmandu Process’ for developing innovative confidence building measures in the Asia Pacific region. No region is immune from the menace of terrorism. Nepal strongly condemns all acts of terrorism, committed by whomsoever and for whatever purposes. Nepal calls for an early conclusion of a comprehensive convention against terrorism. Never has been the issue of human mobility so prominent in the agenda of the United Nations. Nepal looks forward to the December Conference for the formal adoption of the Global Compact for Safe, Orderly and Regular Migration. Ensuring human rights and well being of all migrant workers remain our priority. Nepal believes that the Compact will serve this purpose and make migration work for all. Nepal has hosted thousands of refugees for decades on a humanitarian ground. The international community must uphold the refugees’ right to return to their homeland safely and with full dignity. The complexities and intractability of global conflicts render the current thrust on conflict prevention even more important. Mediation, an under-utilized tool, can be applicable in all phases of the conflict continuum. Nepal recently marked the six decades of partnership for peace with the UN. 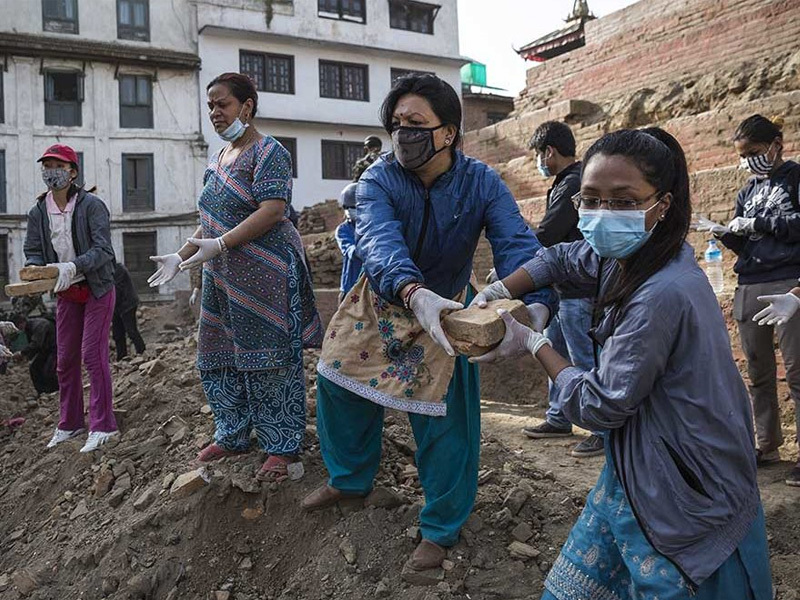 Nepal has responded to every call, even at the shortest notice and without national caveats. Nepal welcomes the Secretary General’s initiative of ‘Action for Peacekeeping’ and has endorsed the Declaration on Peacekeeping Operations. Troops and police contributing countries must be given fair opportunities to serve at the leadership positions, both in the headquarters and the field missions. A sustained partnership for capacity building of peacekeepers and providing for their safety and security can enhance performance of peace operations. Nepal condemns attacks on peacekeepers. Ending the indignity of sexual exploitation and abuse is a must. Nonetheless, peace missions alone cannot substitute the home-grown preventive as well as conflict resolution measures.Our own experience tells that peacekeeping cannot do what the politically-negotiated settlements can. Nepal’s commitment to the protection and promotion of human rights is total and unflinching. We hold that development, democracy and respect for human rights as interdependent and mutually reinforcing. As a member of the Human Rights Council, we will continue to play our constructive role to deliver on Council’s mandates. The ongoing transitional justice process in Nepal respects the comprehensive peace accord as well as the ground reality for sustaining peace and delivering justice. We will not allow impunity in serious violations of human rights and humanitarian laws. We are living in an uncertain world. Cold-war rivalries are re-surfacing. Trade tensions are building up. Multilateralism is being questioned. The Secretary General’s opening statement largely captures the realities of contemporary world and the sentiment of the Member States; be it in the field of peace and security or in sustainable development, climate change, migration and technology. We underscore the centrality of the United Nations as the most legitimate multilateral forum to deliberate on the challenges that we all confront globally. It is the obligation of all Member States to preserve the sanctity of multilateralism and uphold respect for international law. The problems that we confront today at global scale can only be overcome by global collaboration and partnership in absolute trust and confidence. We are yet to make international system truly inclusive that promotes fairness, equality and justice for all states, bigger or smaller. Before I conclude, Madam President, let me reiterate Nepal’s profound commitment to the principles and purposes enshrined in the UN Charter. We remain as firm as we have been in past 63 years since we joined this organization. The onus to give direction to the world lies on us. Our collective wisdom and leadership should aim at the realization of aspiration of all for peace and prosperity. Let us make a collective resolve that the 21st century history will not be written as a history of confrontation and conflict; of poverty, exclusion and under-development; of injustice and exploitation. It should rather be a history of cooperation and harmony; of prosperity, inclusion and development; and of justice and fairness.